Following my most recent trip along the East Coast of Australia Magnetic Island has quickly become one of my new favourite destinations in Oz. But not only mine – it was a firm favourite for pretty much everyone on my Australia tour too! So what makes this awesome little island such a great place to add into your travel plans? The main draw of Magnetic Island is of course the fact it’s an island! And as with most island that means the pace of life is slowed down, the beaches are fringed with palm trees and there’s a certain air of relaxation about the place. After the chaos of spots like Cairns and Airlie Beach this is a welcome spot to chill out and recover – unless of course you’re staying at Base Hostel in which case the beers are flowing! Despite it’s small size Magnetic Island has plenty of coves and beaches to explore which are easily accessible by the local buses or Barbie Cars (I’ll get to them later!) so make sure you head out and explore. It’s also worth heading up to the Fort Lookout (ideally for sunset) for epic 360 views across the island and to discover some more about the recent history of the place and it’s significance during WW2. 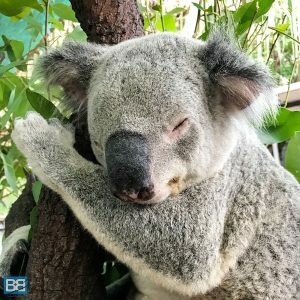 Magnetic Island is a hotspot for Aussie wildlife and one of the best places in Australia to spot wild koalas – and who doesn’t love koalas?! Head to the fort lookout and spend some time wandering around the tracks looking up – you’re pretty much guaranteed to find some…but don’t blame me if you dont! The other famous locals on the island are the Rock Wallabies. You can find these bouncy little fellas on the northern end of Geoffreys Bay down a short path/road. Check out the boulders and you’ll see them chilling in the sun and if you have some patience they’ll even hop down and eat out of your hand. When it comes to wildlife there’s plenty of marine animals to check out too – Geoffreys Bay is one of the islands best snorkel spots and you’ll find plenty of fish, stingrays and coral gardens. If you are up for a bit more of an adventure head down the walking tracks to Arthur Bay which is apparently even more awesome for a dip in the big blue! 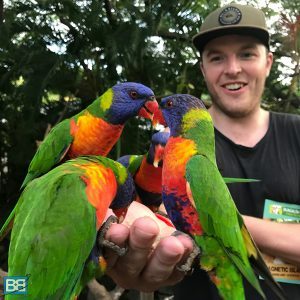 Jump on the Bungalow Bay YHA Wildlife tour to meet even more critters and feed some of the amazingly colourful lorikeets each day at 4:30pm – well worth going along to even if you just want to take pictures. One of the most popular things to do on Magnetic Island is to hire the famous motes or “Barbie Cars”. This colourful and tiny soft top cars are an awesome way to get out of your hostel and explore everything the island has to offer. There are only about 12kms of road on Magnetic Island so it’s not a long drive between any of the beaches and cruising along in the sunshine with the wind in your hair is a pretty awesome way to spend the day! 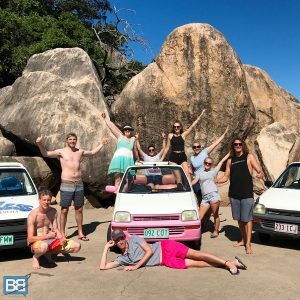 It’s about $89AUD per car (+ option $11 no worries insurance) so rustle up a group of travel buddies and it works out pretty cheap, especially if your hostel includes free snorkel hire too! Magnetic Island is situated just off the coast of Townville (about 20mins ferry ride) in Northern Queensland. And if you’re travelling on a Loka Travel Bus Pass (north or south) it’s one of the included stops and your return ferries to the island are also already bundled into your pass – easy as! 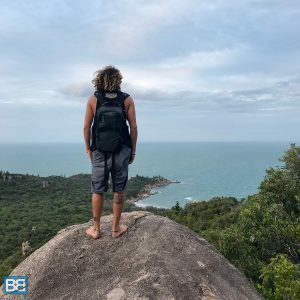 There are two main bases for backpackers heading to Magnetic Island – Base and Bungalow Bay YHA. If you want party vibes then Base Hostel is the place to head! It’s beach front with amazing ocean views and the in house bar is a hub for awesome parties, including the famous Magnetic Island Full Moon Party. On the other hand you’re looking for something a bit more chilled then the Bungalow Bay YHA provides laid back living amongst some amazing tropical rainforest and is my personal favourite out of the two. They also have an amazing Wildlife Sanctuary where you can cuddle koalas, feed lorikeets and meet some other awesome Aussies Wildlife too! Although not beach front it’s only a few minutes stroll from the ocean and some great places to eat. Both Base and Bungalow Bay offer awesome package deals too which include return ferry transfers, a welcome drink, snorkel hire and 2 nights accommodation. The Bungalow Bay one is slightly more expensive but includes a full wildlife tour, the chance to cuddle a koala and a picture of it too! 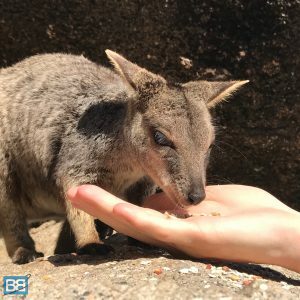 The Base Magnetic Island Cheap deal is $108 and the Bungalow Bay Koala Cuddle Package is $145 – so neither are really going to break the bank! Check out RTW Backpackers for more info. Have you visited Magnetic Island?